“Grandpa, let’s have a walk in the rain with our umbrellas,” little Mihir eagerly requested. In a few minutes, they were walking through the streets. Mihir noticed water seeping through a hole in his grandpa’s umbrella. “It has been like this for quite some time, kid. Let it be so. I’ll not allow anyone to touch this,” he smiled and said. Mihir smiled in awe. Memories of a beautiful summer shone in the radiant glow of his grandpa’s eyes. 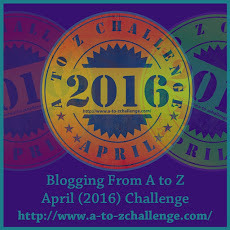 This is my third year of participating in the A-to-Z blogging challenge and like last year, I hope to complete the challenge this year too. This post is written in response to the letter U. The three judges for the school dance competition approached Neha. “You’ve scored more than your nearest competitor Shruti. But we’ve decided that the winner’s trophy will go to her,” they said curtly. “Shruti is the Governor’s grand-daughter. The school is struggling for funds and this will help us. Please don’t make an issue. That’s why we’re telling you now,” the senior-most judge tried to pacify Neha. A year later, Neha won the inter-state trophy with another school. Fate gave a second trophy too – the people who had snubbed Neha were in attendance. This is my third year of participating in the A-to-Z blogging challenge and like last year, I hope to complete the challenge this year too. This post is written in response to the letter T.
She ran towards the beach and was glad that her favorite spot was not occupied. Retrieving a stick which was kept hidden, she began creating drawings. Birds, boats and bridges were beautifully drawn. She felt a lot better after an hour of sketching on the sand. Her breathing was calmer and thinking, clearer. A quarrelsome husband had been driving her crazy the last few months. The beach was her solace and serendipity had shown her the craft. This is my third year of participating in the A-to-Z blogging challenge and like last year, I hope to complete the challenge this year too. This post is written in response to the letter S.
The interview was on the 28th floor of the building. Tanya gasped when she realized this. “I’ll climb the stairs,” she decided. Her mother’s fighting spirit filled her thoughts. She knew the monsters in her mind had to be overcome. Reluctantly, she stepped on to the elevator. She became increasingly agitated as it spurred upwards but was visibly relieved when she reached the destination. Years before, she had been thrilled to ride on elevators until she was witness to a freak accident which claimed her mother’s life. A proud Tanya had managed to banish the reluctance by strength of character. This is my third year of participating in the A-to-Z blogging challenge and like last year, I hope to complete the challenge this year too. This post is written in response to the letter R.
The stars in the night sky was a sight to behold. The vast blackness was being threatened by the brilliant, glittering objects. Little Ananya could see the lights in the houses on her street. She saw a young boy in a warm embrace with his parents. She had often wondered why God created beautiful things all around but failed to illuminate her life. The question lingered on the night. She had had enough of being an orphan. This is my third year of participating in the A-to-Z blogging challenge and like last year, I hope to complete the challenge this year too. This post is written in response to the letter Q.
Rishabh was glad he took up Ayurvedic medicine for studies. He was fascinated by the cure that the medicines provided. Excitement was at its peak on the first day of medical college. He mingled quite easily with his new mates, some of whom were equally, if not more, excited. The professor entered the room and the class was silent. “Did he just say Severus Snape?” a bewildered Rishabh asked a fellow student sitting near him a little too loudly. The professor joined in the laughter across the class. This is my third year of participating in the A-to-Z blogging challenge and like last year, I hope to complete the challenge this year too. This post is written in response to the letter P.
The scarcity of water was unprecedented. People were on the streets, demanding water and help from a lethargic Government. The minister for water resources sat in a comfortable chair in his office. There was an offer from a neighboring country for supply of water. He directed his secretary to channel all the water to the minister’s home village. He glanced at the oath of office placed on his desk. “I know I have to do right without fear or favor, affection or ill-will. But if I do not help myself first, how can I help others? All people certainly includes me and my family too!” the minister resorted to a dumb interpretation of his oath of office. The helpless secretary knew better than to argue. This is my third year of participating in the A-to-Z blogging challenge and like last year, I hope to complete the challenge this year too. This post is written in response to the letter O.